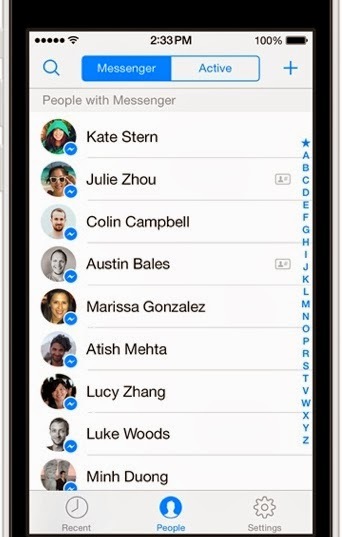 One of the social networking giant of in the world Facebook has launched another interface for their FB messenger. This is more like iOS 7 inspired, and faster performance, along with new chat features like the ability to message someone with justtheir phone number, and there is a new icon that indicates which friends are logged into the app. Why You Should Download This New FB Messenger? ==>Make free calls, even to friends in other countries. ==>See who's available on Messenger and who’s active on Facebook. ==>Stay logged in so you never miss a message. ==>Turn off notifications when you’re working, sleeping or just need a break. And lots more… You just have to get it running on your device. For Android users, visit Google play store to download it or download it here directly While iPhone users should visit iTunes store to get it running. I advice you to share this thread by clicking the share link below!! !